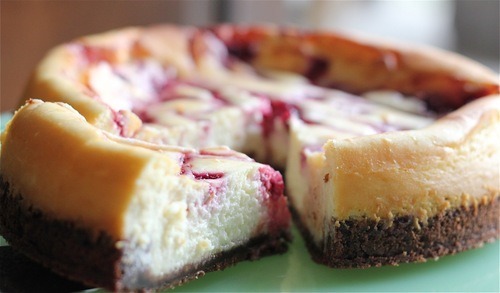 This cheesecake is, in a word, DIVINE! Using neufchatel cheese creates a mellow, sweet, smooth and light texture. Fresh raspberry puree adds a slight tang. And making a chocolatey, chewy cookie crust gives flavor depth and mouth feel that regular graham cracker crusts can’t compete with. Cheesecake Factory, EAT YOUR HEART OUT! This recipe makes one 8 inch round cheesecake. Dough will be very sticky. Flour your hands and press dough evenly into bottom of greased 8 inch round springform pan. Par-bake at 375 degrees for 5 minutes. Once out of the oven turn temp down to 325 degrees. Pour batter over warm crust and dollop teaspoonfuls of the raspberry puree around the top of batter. Use a butter knife to cut through the puree and batter creating a swirl effect. Make sure you don’t cut through the crust. Bake at 325 degrees for 1hr-1hr 15min. Top will still jiggle when you take it out so no worries. The cheesecake will continue to set up as it cools. Cool on rack for about 30 minutes to an hour and then wrap with plastic wrap and cool completely in fridge. About 3 hours. 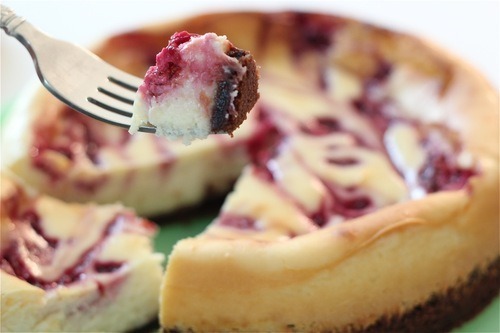 Unlike traditional cheesecakes that are dense and heavy, this dessert is good to the very last bite!